Every MBA student, every entrepreneur, every businessman should try and work in Africa…… I’m serious. If you can cut it in Africa, you can cut it anywhere in the world. You may or may not know that Jude and I are currently trying to build a house here in Zambia. The purpose is to give ourselves and others a base to work from and develop the site more in the future. We work with people all over Zambia, and well you just need a place to hang it all on for a while. Now Jude and I already work in Africa. We lead the work of the UK charity Dignity and over the years we have amassed some “experience” of not only working in this part of the world, but also with each other as well. Sometimes I’m not sure which one is hardest……. Over the last month I have spent more time chasing “stuff” than I think I ever have done. Today it has been a water tank and plumbing fittings coming up from Lusaka. Last week at one point it was cement and an apocryphal 30 tones of stone that a company had. I’ve also had to open a new bank account to get a cheque book here in Zambia. I’m told that the cards and cheque book are on the way……mmmmm of course they are. Finding builders was fun. Negotiating, getting people to turn up and the like. 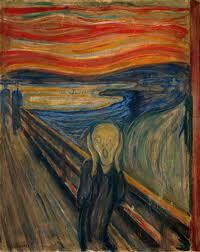 Some days I feel like the man in The Scream by Edvard Munch 🙂 If I’m honest I’ve often felt like that here, that feeling is not new! It’s a curious collision between difficult logistics, distances, cost, lack of education, a clash of culture and a thousand other things. That’s why every self respecting self made person should spend time in this continent. I really do believe it is true that if you can do it here, you can do it everywhere. Now please don’t think I’m moaning, because I’m not. Yes it is chaos sometimes, yes it’s frantic and yes there are days that I cannot be bothered. However, somewhere it’s fun and somewhere I like this continent with all it’s dust and mania. There are days (usually when things go right) where I would not be anywhere else in the world. The people are generally lovely and some of the needs are just to big to be ignored in my nice European bubble. God has also brought me here as well, so I know I can’t be too far off His direction, and when the chips are down that is reassuring. Now I don’t have an MBA, and will probably never have. However this post is for all those students of Africa who have cut it, who can make mountains move with little more than a piece of metal and gaffe tape and fix vehicles with a paperclip. To all those pioneers, to all those distant missionaries and entrepreneurs, to Roger who spent hours hitting his Soya machine with a hammer and won!, you are all deserving of some well earned praise and recognition. To use my slightly scouse heritage…..
Africa, it’s dead ‘ard it is…….. I received an email the other day regarding what is popularly called the New Atheism. In other words, the atheism made popular by Dawkins et. al. Within the email was the following point that I think is so brilliant I thought I would re-produce it here. I think that is utterly brilliant. One of the points I am always making in regarding to Christianity is that you can measure the quality of your faith by what you do. It is a yard stick if you like. Does this then mean that Atheism is not up to much…..????? quote taken from J. John of The Philo Trust, you can read the rest of the article here.